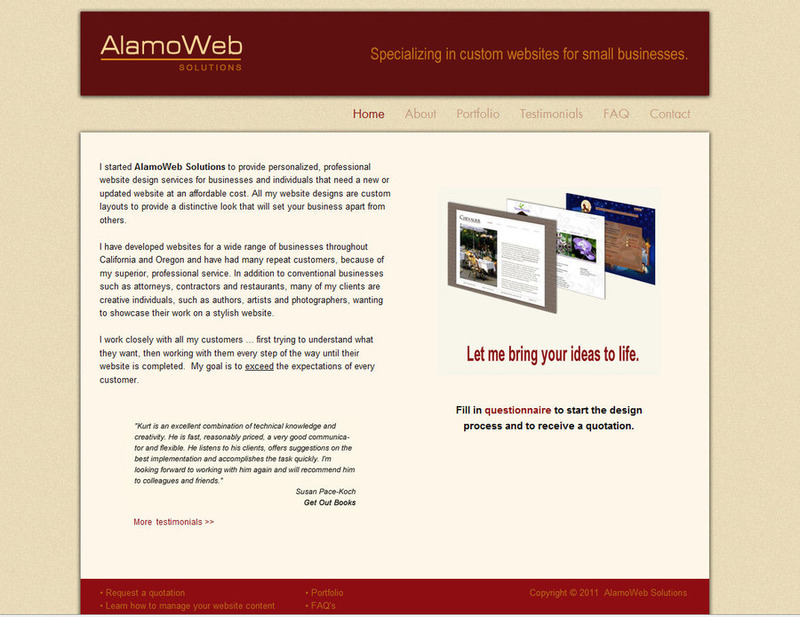 AlamoWeb Solutions specializes in designing affordable, custom websites for small businesses and restaurants. AlamoWeb Solutions offers a full range of personalized, web services to make designing your website as fast and as simple as possible. Services include both full website design and mobile-optimized website design and SEO to help give your business a competitive edge. After getting preliminary inputs from you, a free website mockup will be created so you can see what your full website will look like before you pay any money. Once the mockup is reviewed, your website can be designed and published in as little as a 2 weeks. And once your website is published, you'll have the option to manage the content using a simple-to-use web interface. So if you need a new full website or a mobile optimized website or both, contact AlamoWeb Solutions. AlamoWeb Solutions is one of the highest rated website designers in the San Francisco area, so please visit Yelp to read customer reviews. AlamoWeb Solutions, located in Alamo, CA specializes in the design of affordable, custom websites for small businesses and restaurants in the San Francisco Bay Area. My goal is to provide high-valued, personalized, professional website design services. See reviews on Yelp and refer to my alamowebsolutions.com website for more information. Shown is a recent website sample published in January, 2014.